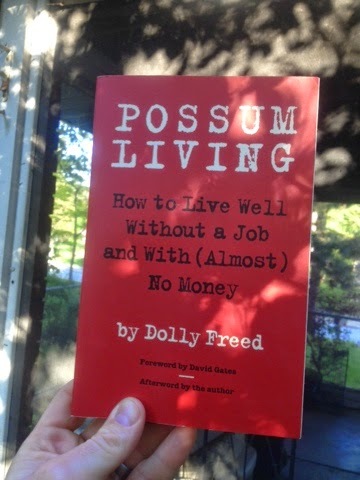 DIRTBAG BOOKCLUB: reviewing POSSUM LIVING-HOW TO LIVE WELL WITHOUT A JOB AND WITH (ALMOST) NO MONEY by Dolly Freed | DBP MAGAZINE ONLINE The World's Best Free Whitewater Publication. If that title doesn’t speak to you, dirtbag… Then you might as well fold up your tent and move to the suburbs. This seventies classic, back in print, is a dirtbag bible of sorts. It’s all there: gardening, gathering, housing, heating, heck even making alcohol! While the original version was written by a then 18 year old with a 7th grade education, the latest edition includes new insights from an older, wiser Dolly Freed. Now granted, Dolly and her dad were living off the land on a half-acre lot outside Philly. We here at DBP MAGAZINE ONLINE sincerely hope you our gentle readers are living somewhere much cooler for the boating season, say The Forks, ME for instance, a virtual dirtbag Kingdom of Heaven on Earth. But hey, you gotta start somewhere! Start by finding this book at your local Goodwill… And pick up some roadkill on the way home would ya? …We tell people who have the Protestant Work Ethic and might resent us that we have to go fishing whether we want to or not, for food. But the truth is, we always do what we want. “We’re so isolated we can hardly get the necessities of life, and when we do, why half the time it ain’t fit to drink” (old Appalachian saying). …The Old Fool likes to go around saying he can’t decide what he wants to be when he grows up. But truthfully, not having to make decisions is one of the great luxuries of life – right up there with not having to go to work. We just drift along from day to day. We have a roof over our heads, clothes to wear, and we eat and drink well. We have and get the good things of life so easily it seems silly to go to some boring, meaningless, frustrating job to get the money to buy them, yet almost everyone does. “Earning their way in life,” they call it. “Slavery,” I call it.